Last year at this time I was in upstate New York visiting friends and family. I posted a whole lot of photos from that trip while I was there. But there are some pictures that I didn't post, for one reason or another. This is one of them. The Lake House in Albany, New York. This is the lake house in Albany's Washington Park. I don't know much about its history except that it is not the first lake house on this site. 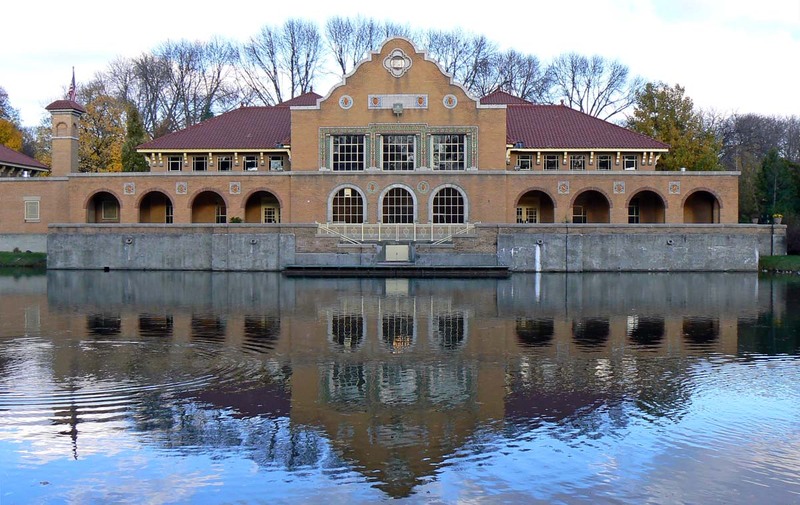 The architecture is Spanish Revival, and the land side of the building is an amphitheater. And for some stupid reason, I have no pictures of that. If you haven't seen the other photos from that trip, or just want to stroll down memory lane, look in the sidebar and click on the "albany new york" topic category. I've enlarged most of the photos in that collection so you'll see them bigger than they were originally. Last Wednesday I took some photos of the sunrise (posted on Thursday). But I also turned around and took a few images of the clouds to the west. They were making all kinds of interesting shapes and the changing light made them very pretty. The whispiness makes me want to call them cirrus. Click on the picture to ennebulate*. I think these would be classified as a kind of cirrus cloud, but I'm not sure. 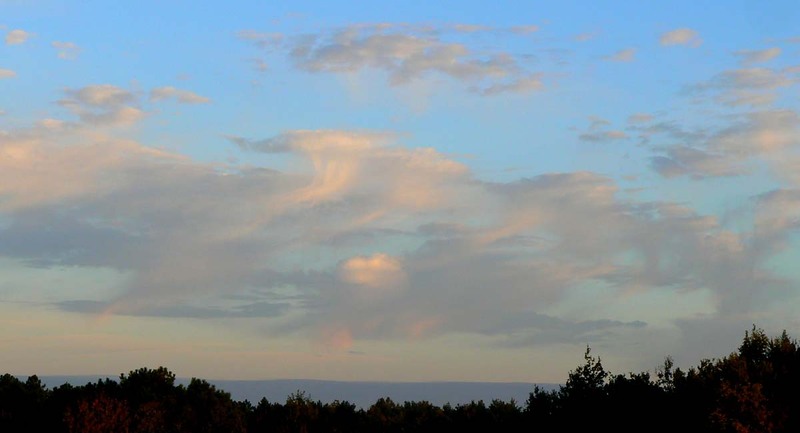 There are so many variations on the basic cloud types and they can be difficult to differentiate. And I'm not a meteorologist so I've never studied them in any detail. No matter. They're still fun to look at. *With apologies to Phil Plait at Bad Astronomy. He frequently makes up a word that relates to the image that he uses in place of the old and boring "enlarge." 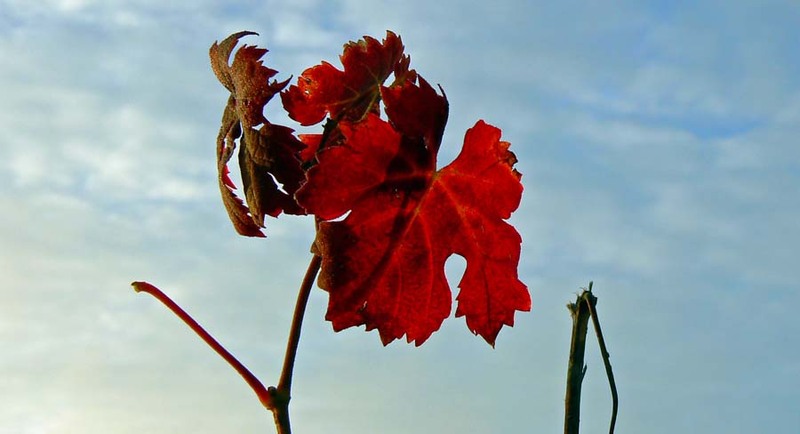 There are two or three parcels of grapes out in the vineyard that have been abandoned. I suspect the owners died or have become incapacitated and there is no new generation to take over. The land might be in limbo until it can be dealt with after the inheritance process, or it may be for sale with no buyers in sight. I've been told by locals that agricultural land cannot be easily sold for development here, especially if it's in an A.O.C. designated area. Sad looking bunches that will never be harvested. I'm sure the other growers with adjacent parcels know all about it. But I haven't asked. A couple of the neglected parcels I know of have grown over with trees. You can see the old grape vines and some stakes in the undergrowth. They've been abandoned since we've been here, over seven years now. This one has no trees, but the vines are definitely not tended. They get leggy and produce too many small bunches of grapes instead of a few large bunches. 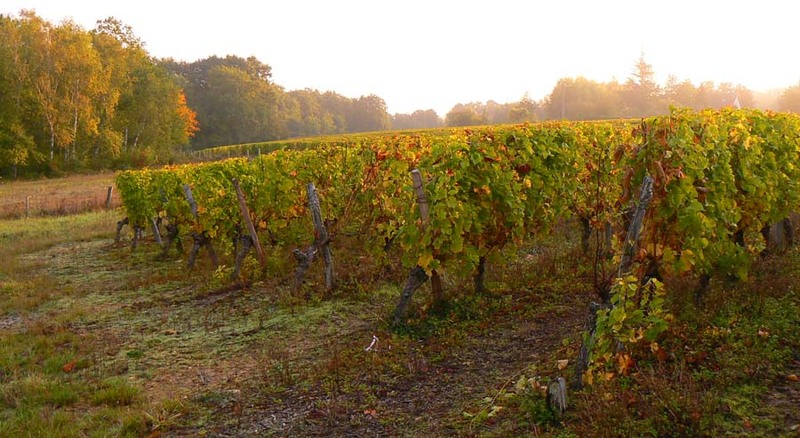 It's too bad, but there is a surplus of wine in France these days. I'm doing my best to help consume it. The sky was mostly clear on Wednesday morning. The waning moon still shone brightly as the sun started to come up. Long banks of clouds hung just above the eastern horizon and the sun lit them up dramatically. There were the usual airliners making their way southward. This morning they had very short vapor trails. The view looking easterly toward the rising sun. The grape harvest has been done for weeks now and wine is happily fermenting all around us. I've already seen some local Touraine Primeur (new wine) in a store. It seems way too early for that. It's usually not out until mid-November. The bernache was early this year, too, so it stands to reason that some new wine is ready. I guess some growers got their harvests in earlier than usual because of the rains we had in September. A wider view looking toward the northeast. We had one of those five-second power outages on Wednesday morning. Just enough to shut down the computers and modem, re-set the clocks, and destroy any tv recording that's under way (we weren't recording anything). Those quick offs and ons can't be very good for the appliances. I wonder what causes them? Tuesday was a crisp clear fall day. It's no surprise, then, that the balloonists took advantage of the calm evening to ply the skies. I hadn't seen this balloon for a month or so, but I noticed it off in the distance heading right for the house. I got the camera and tripod out, hoping it would fly right over me, but it veered off slightly to the west. We see this balloon sailing over our house and the vineyard all summer long. I noticed that a few of the pictures have that little white dot (just below and to the left of the basket) in them, each in a different place relative to the balloon. From what I can tell after doing some light research, it could be Mars. Three other planets, Mercury, Venus, and Saturn, are visible in the night sky now, but I don't think they're in the right position to be visible at this time of day. Of course, the object could be a satellite reflecting the setting sun. I didn't notice it at all while I was taking the pictures. This is not my idea of a proper hood ornament. 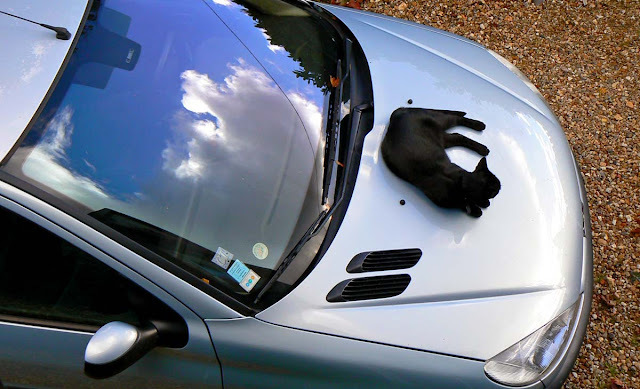 The car had been sitting out in the sun one recent afternoon and Bertie obviously felt it would be a warm place to sit. He stretched and rolled over a few times. He was there long enough for me to go in and get the camera. Then, appropriately rested and warmed, he went off on more adventures. I call it "Chat noir sur Peugeot." Bertie is spending more and more time in the garage and utility room these days. I suspect it's because it's getting colder outside. We're closing him in earlier as it gets dark earlier. I really don't want him out overnight when it's really cold. When he's out, we don't close the garage window so that he can come inside when he wants to. But leaving the window open makes the garage cold. The window has an iron grille on it that keeps people and big critters out, but the cat can go right through. I think we need to get one of those cat flap-doors. When it's cold and clear outside and there's not much wind, we can see this sight from out in the vineyard. On this particular morning, it looked eerily like a mushroom cloud. And the cloud does have atomic origins; it's the steam from the cooling towers of a nearby nuclear power generator. It's a bit unnerving to see a mushroom cloud when you're out walking the dog. This centrale nucléaire is in St.-Laurent-Nouan on the Loire River, about sixty kilometers (thirty-seven miles) north of here. It's one of the many plants in France that generate well over eighty percent of the nation's electricity. That's why I can say that my home appliances are nuclear powered. This is what the vineyard looks like now. The freeze we had on Thursday had an instant effect on the grape vines. The leaves went from yellow and red to orange and brown. Just like that. The view from our windows is wonderful. But it won't last. Looking southwest across the vineyards. The sun was just about level with the horizon. Before we know it the leaves will drop. Then the pruners will start showing up for their winter-long task of trimming the vines. As I always say, it's pretty all year long, and the changes are interesting to watch no matter how many times I see it happen. Ken and I got a good bit of yard work done on Saturday in advance of a weather system that's moving through. I took a lot of sawdust and bits of bark and wood from the firewood cutting out to the burn pile. Then we both worked on pulling up all the dead and dying tomato, eggplant, pepper, and corn plants and tossing them on the burn pile. We stowed all the garden stakes in the shed and then put a big tarp over the burn pile to keep it dry. We'll have another fire before too long. Living in the center of France, we are under a major southbound flight path from Paris, London, Brussels, Amsterdam, and other northern cities. The destinations, I imagine, are places like Lyon, Bordeaux, Marseille, Nice, and points in Corsica, Spain, Italy, North Africa, and beyond. This view of our piece of the sky is typical in the mornings around eight o'clock. A few of the southbound airliners I see at sunrise. Most of the flights I see are going south. There are some northbound planes, usually more to our west than right over us. Sometimes, usually on a summer evening, I can see the sun glinting off an airplane as it passes overhead. And in the night sky the flashing navigation lights compete with the stars for attention. 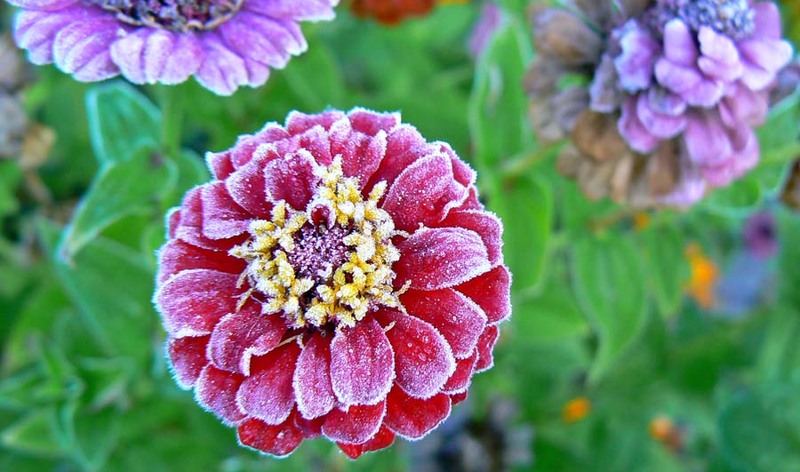 The last of the zinnias got kissed by Jack Frost on Thursday morning. In fact, we all did. Temperatures went below zero in the vineyards and in many other places around town. Our thermometer read 1.8ºC, but it's affixed to the house and probably stays a degree or two warmer than the surrounding fields, especially in the shoulder season. I took a lot of photos of the flowers, but none of them came out until I went back outside with the tripod. These came out better, but I was not as patient as I should have been to get good quality images. Photography is art, after all, and it takes patience, expertise, and talent. I have short supplies of each. The ice crystals on these purple petals make them look like candy. But I like the pictures, nonetheless. 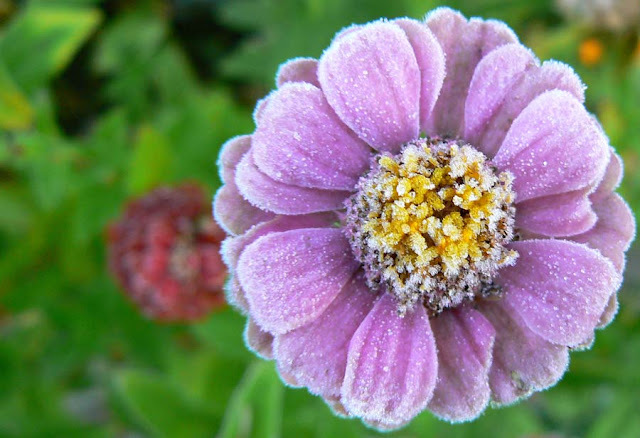 It's a record of the first real frost of the season. People we've talked to have all said it's early this year. I think they're right. I'm sure everyone is thinking that we're in for a cold winter. 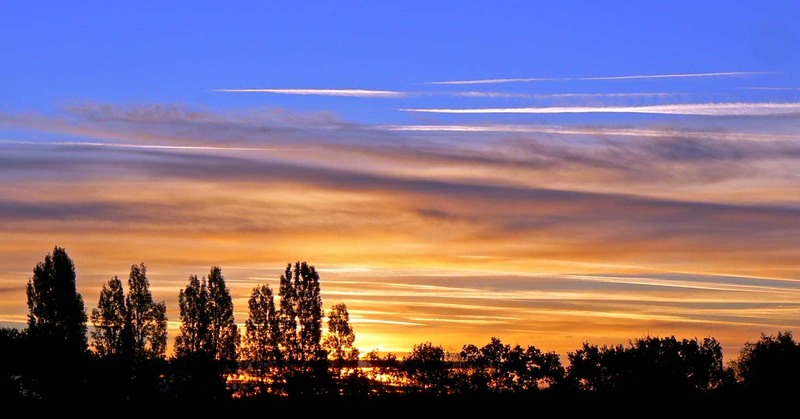 The national weather service, Météo France, even predicted a colder than normal season. What do they know. They can hardly predict the weekend weather. But still. I'm hoping for a normal winter. Not too cold, but not too warm. A little snow, but not much. And no big hurricanes like we had last February. And a nice, lovely spring. Is that too much to ask? And this will be their last hurrah. I've saved seeds and will plant them again next spring. This morning, twenty-four hours after I took these photos, the flowers are all brown. The frost was their undoing. All the leaves in the vineyard also quickly changed to orange/golden brown since the frost. It's beautiful, but temporary. Soon they'll all be on the ground. I've been a Lands' End shopper for a long time. I don't buy much these days, but I do once in a while. I have my orders shipped to friends or family when I'm planning a trip to the US and pick them up there. I also shop sporadically at L.L. Bean, and they've been sending the American catalogs to me regularly in France since I moved. 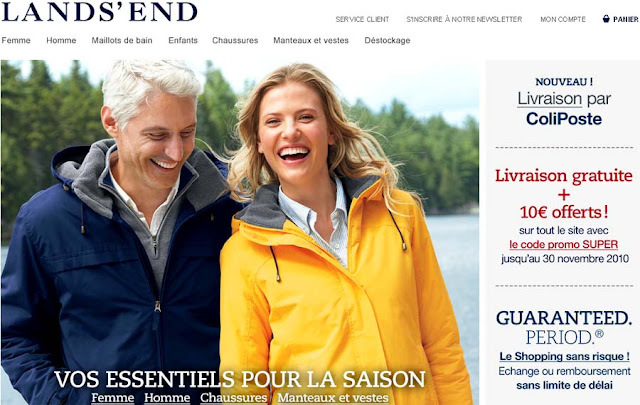 A portion of Lands' End France homepage. But this showed up in my mailbox this week. It's a Lands' End catalog in French, announcing that they've set up shop in France. Now I can get the French catalog and be able to shop online and get my deliveries at home instead of in the US. Here's the web site if you want to take a look. A sample of what's in the catalog. Interestingly, however, I noticed that the prices seem rather high, especially given today's exchange rate, and not so out of line with normal brand name clothing sold in France (which can be quite pricey). So, I probably won't be doing all that much Lands' End shopping in France after all. I wonder if they'll find a healthy market for their products here. As I like to say, it's a global world. 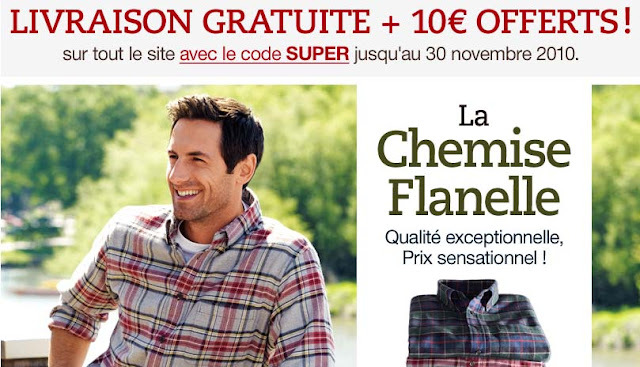 Both of these images are screen captures from the Lands' End France web site. I don't know why we call these kinds of things "bread." It's really a cake, and that's what they're called in French. Since I had the bounty of a nice big pumpkin, I've been making raviolis, timbales, and this cake. I also froze some of the flesh for another use later in the season. Freshly baked pumpkin and walnut bread. Yummy! This cake is made with walnuts (given to us by a friend whose tree produced a lot this year) and gingembre confit (candied ginger) that we got at the Asian market. All very good stuff! Here's the recipe if you're interested. 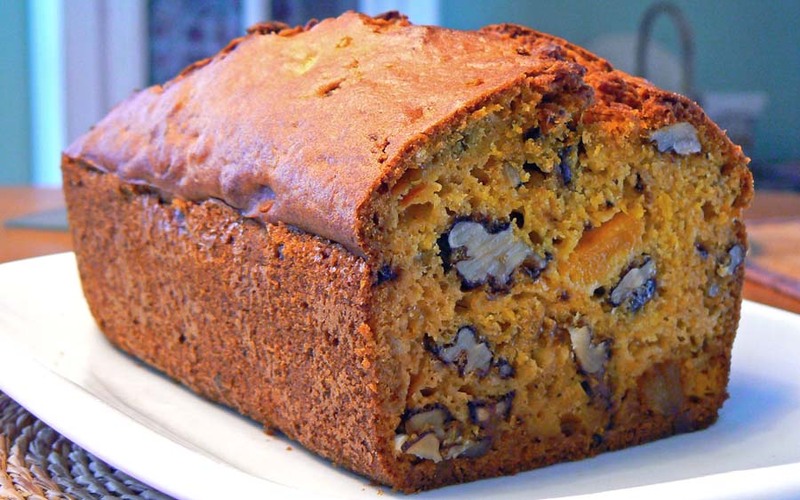 It's my own, adapted from various other pumpkin bread recipes. 1/3 cup of plain yogurt, milk, or water, whatever you like. Pour the batter into the buttered loaf pan and bake for 55 to 65 minutes. Test with a wooden skewer; when it comes out of the loaf clean, the cake is done. Cool on a rack then turn out and slice with a serrated knife. I talked about it. I did it. But I made one mistake: I forgot to save some seeds for planting. Oh well. I found a recipe on the internet that said to boil the seeds in salty water before roasting them. What the heck, I said. So I did. The seeds after boiling, but before roasting. They turned out very good. Toward the end of the roasting they started popping like popcorn. Pumpkin seeds all over the oven. But I'm not one to panic. I dutifully retrieved them and added them back into the fold. The toasted seeds. There are many more than you see here. I only took one photo of our meal on Sunday. Too much going on and too much fun to be had. But I did manage this shot of the ravioli after I made them and before they got cooked. The filling is roasted pumpkin with minced sage leaves, grated parmesan, ground fennel seeds, grated nutmeg, salt, pepper, and an egg yolk. Raw raviolis waiting for the water to boil. They cook for about four minutes. I made the pasta with eggs and flour and a touch of milk. Marcella Hazan (The Classic Italian Cookbook) says that milk in the dough helps stuffed pastas (like ravioli or tortellini) to stick together. It seems to have worked. I rolled the dough on the pasta machine, cut the two halves of each ravioli with a fluted cutter, then pressed them together with the ravioli tool I found in the US last year. It all worked great. I served three raviolis per person with sage butter, which is simply whole sage leaves cooked in melted butter with salt and pepper, and sprinkled toasted walnuts on top. I thought they tasted great! The main course was a pintade (guinea hen) roasted with shallots and a tray of roasted autumn vegetables (turnips, rutabaga, carrots, celery root, onions) with herbs. Ken wrote about it and posted his photos here. We also had a small green salad with a platter of cheeses, then a walnut tart for dessert. Now I have a little pasta and a lot of filling left over, so I may make some more raviolis today. The rest of the filling will be made into timbales. 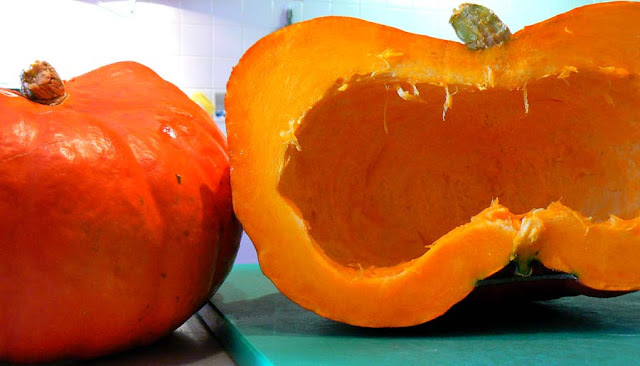 A friend and neighbor of ours brought us une citrouille (a pumpkin) last week. She said that the plant just came up in her garden. A volunteer from last year or the year before. She said that there were so many pumpkins that she didn't know what to do with them. I know how that is. So she brought one to us, and we're glad she did. 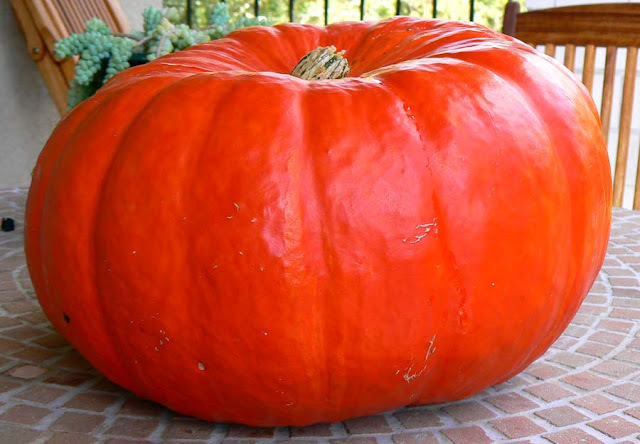 A French pumpkin. Not the Jack O'lantern variety we're used to in the US. But very good to eat. It just so happens that we didn't plant pumpkins this year. So the surplus from G's garden was quite welcome. I cut it open yesterday and roasted half of it. I'm making pumpkin ravioli as the appetizer for Sunday lunch. I don't know if I'll get it together to take photos of that, since we're having company and I tend to get a little busy. But if I do, you'll see them here. I roasted half. Here it is before roasting with the seeds scooped out. I'll roast the other half soon. The other benefit of getting a nice pumpkin is that we have the seeds. I'll keep a dozen or so of them to plant in the garden next year. Don't worry, I'll thin them down to one or two plants so that we're not overrun with pumpkins. The rest of the seeds we will roast in the oven and eat. Pumpkin seeds are great snacks and we will certainly enjoy them. If the pumpkins come up well next year, we'll have a bumper crop. Pumpkin seeds ready to be roasted and eaten or dried and stored for planting next year. I'm not at all sure what plant this is that produces these luxuriant seeds every fall. Every time I see them I tell myself that I will try to remember and look them up, but I always forget. So I still don't know. But they're out there again now. Anybody recognize these? Thanks to Susan: they're wild clematis. Friday was the first heating day of the season. The house was chilly enough to turn on the heating system. I only had it on for an hour and half and that was enough for the house to get comfortable. Later in the day we'll be cooking, so the oven will be on, and if that's not enough to keep us comfy I'll build a fire in the wood stove. Neither one of us likes it too warm in the house, so it doesn't take much to feel okay. It's supposed to start feeling downright cold over the next few days. Still, the sun is out and there's been no wind (although a system is moving through right now) so the cold isn't penetrating, and if you're out in the sun it's quite pleasant. Good autumn weather. The trees are dropping their leaves at a faster pace right now, but most of them are still on the trees. Raking won't have to happen for a while yet. Besides, there's still firewood to cut. I stopped by the chainsaw hospital on Thursday, but the part they ordered still hasn't arrived, so I'm still waiting. I've been mentioning la bernache recently. It's the fresh grape juice that's just beginning to ferment and around this time of year, just as the grape harvest is finishing up, you can find bernache at festivals and in the local markets. 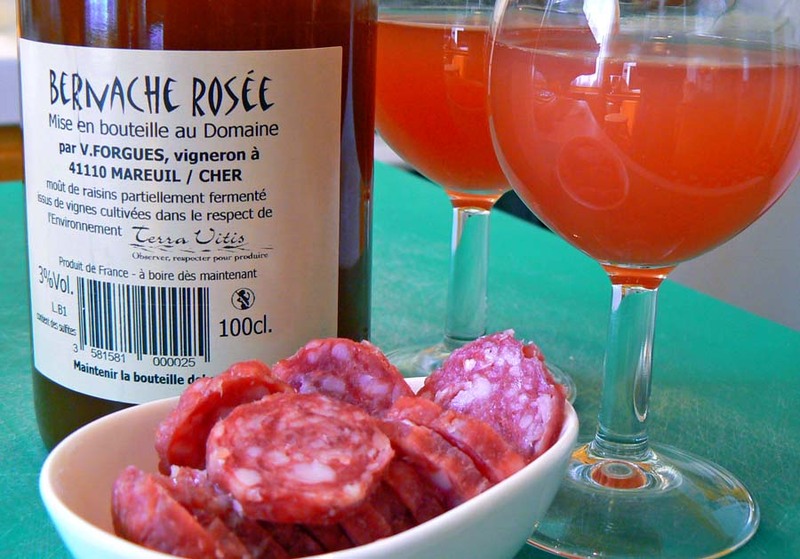 We saw a big display of mushrooms and bernache at our local Intermarché supermarket on Thursday and couldn't resist a bottle of the bernache rosée. The bernache of one of our neighbors is sold in the local supermarket. How cool is that? The winemaker is just down the road from us. We've never visited her place, but we intend to before too long. Before we found this, I had thought that bernache was only white. But now I know it comes in a rosé as well. And it's good! It kind of reminds me of Orangina, if you know what that is. It's got the same sweetness and the same fizziness. It's also got one thing that Orangina does not: alcohol, but only three percent. It made a great little apéro on Thursday before lunch. In just over a month, the next stage of this year's wine making will be available: le Touraine primeur. It's the same idea as Beaujolais Nouveau, the young finished wine from the recent harvest. 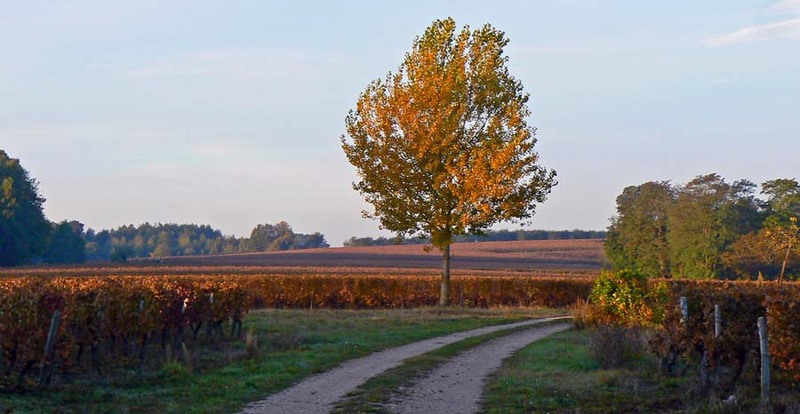 The Touraine version is from our area. It's quickly becoming a Thanksgiving tradition for us. Not much has changed with the Bertie/Callie situation, I'm afraid. The dog still tenses up whenever she sees the cat and wants to chase him. She'll sit and stay if one of us is there to control her, but left on her own she will try to bite Bertie's head off. He takes in all in stride. He's swiped at her a couple of times (we saw a little scratch on her nose the other day) but so far it hasn't deterred her. 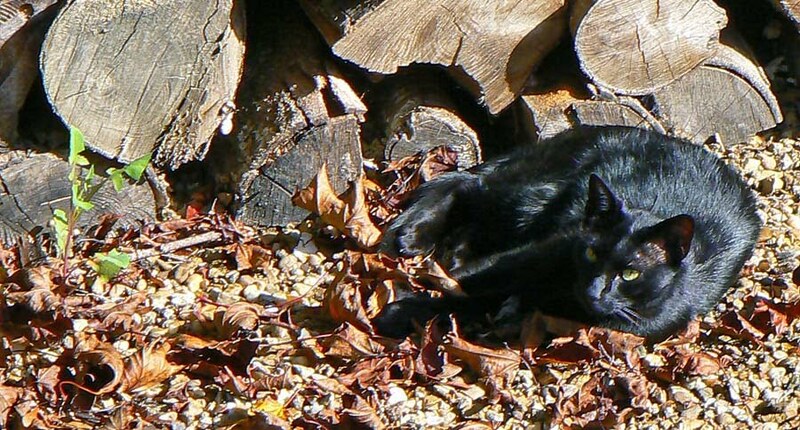 Here's Bertie catching some rays out by the log pile. But his little country life seems to be fine. He has two comfy places to sleep inside, separated from the dog. He eats regularly and well. The fights with the neighborhood cats have all but ended; I suspect the cats have worked out their territorial issues. And sometimes Bertie stays out all night prowling and hunting and doing whatever else hip cats do at night. But most times he comes home before we go to bed and we keep him indoors overnight. We got him a new collar the other day and one of those little capsules that contains a paper with his name and phone number on it. The cat collar is made with elastic so he can wriggle out of it should he get hung up on something. He accepted the collar readily even though he's been without one for months. I keep hoping that somehow the dog will accept the cat in the house. Winter is on its way and it gets cold in the garage. The utility room is warmer, though, so we'll likely move his bed in there soon. I love biscotti. They are delicious dipped in hot coffee or in a glass of wine. I first learned to make them when we lived in San Francisco. They are very easy to make and they've become a fall/winter/holiday tradition in our house. The recipe I started with is made with almonds, and it's very good. These days I have a bounty of walnuts and thought that I should be able to make good biscotti with them. So I did. My very own home-made biscotti. You can dip them in chocolate for a more decadent treat. 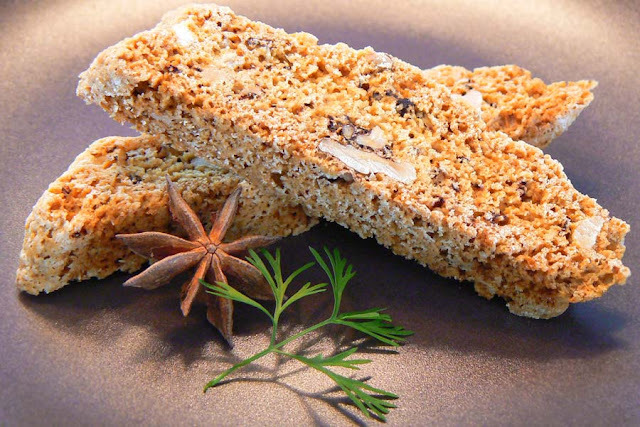 I looked at recipes for walnut biscotti on the internet and found many that included a bit of anise. That sounded good to me. The recipes call for extract of anise, but I have dried star anise in the house and it's very easy to grind one of them up in the mortar and pestle and add it to the recipe. And the fresh walnuts we've been getting are delicious when shelled and toasted and used in place of the almonds. So here's my basic biscotti recipe. You can alter it however you like. If you want to add ground star anise instead of anise extract, put in in with the dry ingredients. Add the egg mixture and mix for about a minute, until well blended. Chop the roasted nuts into halves or thirds and mix them in. Divide the dough in half and make each half into a log about 1/2 inch thick, 1 1/2 inches wide, and 12 inches long (these measurements are approximate, of course). Put them at least 2 inches apart on a silpat-lined or greased and floured baking sheet and bake them in the middle of a 150º (300ºF) oven for 50 minutes or until golden brown. Transfer the two logs onto a rack and let them cool for 5 to 10 minutes. Put them on a cutting board and, using a serrated knife, cut them at a 45º angle into slices 1/2 inch thick. Put the slices back on the baking sheet and return them to a 135º (275ºF) oven for 20 to 25 minutes to toast them. After they cool, store them in a tightly closed tin. The angle of the sun and the colors of the leaves this time of year combine to make some pretty sights around the vineyard. One recent morning, when the mists from the river valley began to clear and the sun came up, I saw this. If you look very closely, you can just see the tip of our roof on the upper right. It looked as if everything were tinged with gold. Maybe I was at the end of a rainbow or something. It was very nice but it didn't last long. The mists continued to burn away and the sun rose higher and the magic evaporated. On Monday morning we had a very dramatic sunrise with blues and pinks and purples and oranges. Unfortunately, I had left the camera in the house. Oh well. There will be more. What is a "bottom dollar" anyway? I know, it's your last bit of money. It's certainly not the opposite of "top dollar." You can pay top dollar for something, meaning that you're paying the highest price. But you never pay bottom dollar for something. Instead, you pay "rock bottom." Why? No one ever pays "rock top" for anything, do they? It seems that the only thing bottom dollars are good for is betting. And I've never heard anyone talk about middle dollars; we must keep those very close to our vests. Even though not many of us actually wear vests. English is a creative and confusing language. "The sun'll come out, tomorrow." Actually, it's been out for a few days and that's been nice. So, as I've mentioned, the chainsaw is in the chainsaw hospital. The other day the oil that lubricates the chain ran out, so I refilled the tank. Then I noticed that oil was leaking out all over the place. This happened once before when I first got the saw, but it stopped. I now know it stopped because the oil level had fallen below the level of the oil cap. It turns out that the oil cap no longer seals the tank. Add to that that I've been using the saw quite a lot and the chain has become a bit dull. So on Friday I took the saw in to the guy that sells and repairs power tools over across the river. He said they could fix (replace) the cap and sharpen the chain and that the saw would be ready some time this week. The chestnuts are falling! The chestnuts are falling! Really, you have to watch out when you're walking in the woods. They hurt when they hit you on the head. 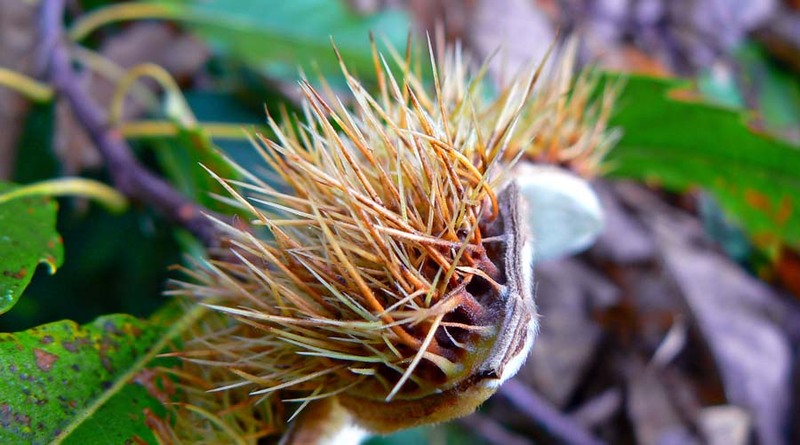 Sometimes the nut falls out of the husk, but most of the time the whole spiky thing comes crashing down. I can usually hear them falling before they hit and get out of the way. But not always. The spiked husk of a chestnut, still on the tree, but opened with chestnut gone. They also fall on the road down the hill from our house. Crushed and mashed chestnuts cover the road until winter's rains wash them away. Chestnuts are good to eat, whether roasted on a open fire (yes, they do that here) or cooked into a stuffing or soup. But you can only eat so many chestnuts. And they're a lot of trouble to deal with. It's easier just to buy them in a jar when you want some. A divided chestnut still in its husk. In French, chestnuts are called châtaignes or marrons. The big round ones are the best for eating and they are the ones referred to as marrons. 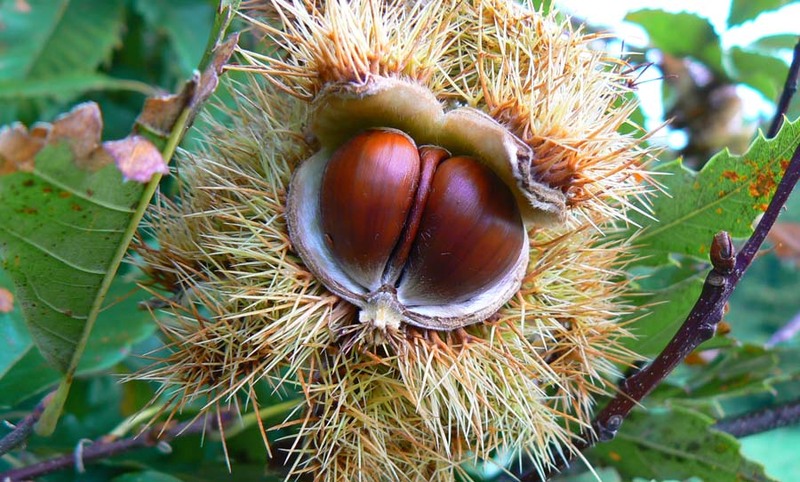 Most of the châtaigniers (chestnut trees) growing around us produce smaller fruits, and often have two or more divided inside the husk (photo above). That makes them less desirable for eating. There's also the marron d'Inde (India chestnut) imported to western Europe in the seventeenth century. That one is is toxic, so you want to stay away from it. Marrons d'Inde have different looking husks (less spiny) but are otherwise very similar looking to edible chestnuts. Each year, as harvest time approaches, the grape growers stop trimming the vines. Here and there a vine will send a tendril up into the sky. Sort of a last gasp, I suppose, before the leaves turn and fall and the pruners show up to cut the year's growth back. A few red leaves against the morning sky. They won't last long. Ken and I were in town Thursday evening to have a drink with some blog readers visiting from Australia. I noticed a sign on one of the café windows that said, "La bernache est arrivée." 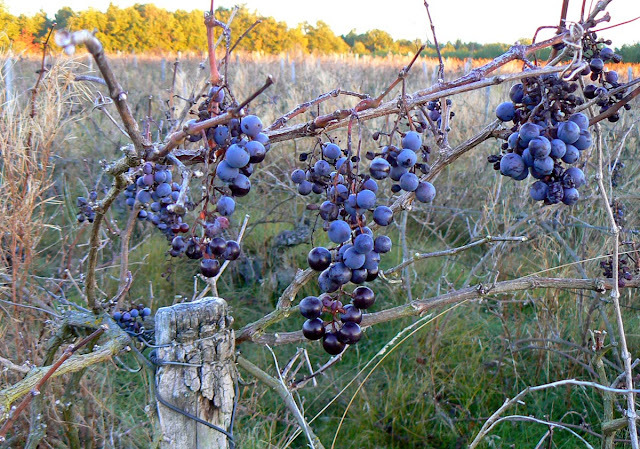 It seems early to me for bernache, given that the grape harvest is still going strong. Normally we see bernache around la toussaint (All Saints Day, November 1). Have I mentioned how much it's rained lately? During the harvest? And that the tractors and harvesters are working in muddy conditions? 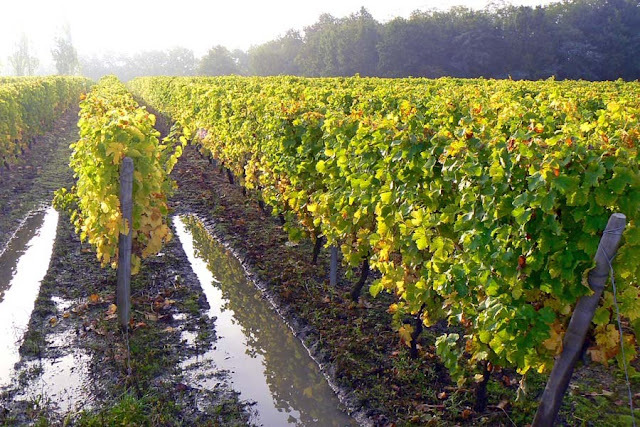 And that they're making deep tracks between the rows of vines that fill up with water? Ah, yes. I thought I had. Callie enjoys drinking from and walking through muddy puddles like these. What I didn't mention is that while the weather is mild the mosquitoes are making hay. Well, no, they're actually making little mosquitoes. All these little puddles of warm water are prime breeding grounds for those pesky devils. 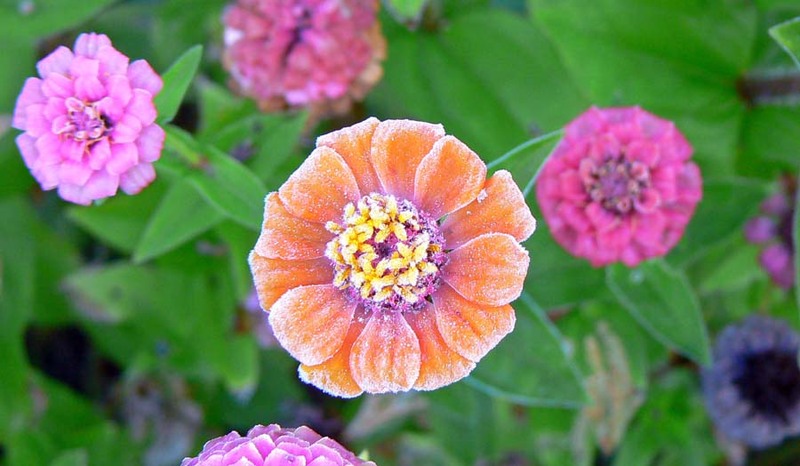 At the first cold snap they'll all be gone. Except for the ones that escape into the house. When Callie was less than a year old, I would often take her over for a walk on the island on the Cher just opposite St.-Aignan. There's a park on the eastern end of the island, where this photo was taken, and a spillway at the very tip where the river splits around the island. The spillway creates a small reservoir of water just above the bridge where there is a lock for boats and, more importantly, there used to be a mill. Looking upstream from the island near the spillway. The little reservoir provided the water to power the mill's turbines. The mill is long gone, but the spillway and reservoir remain, creating a body of slow-moving water at St.-Aignan's front door. There's a boat dock on the St.-Aignan side from which a tour boat departs in summer months, and a local kayak rental company often puts their boats in on the island side. I've even seen the local fire and rescue squad practice water rescues here. Downstream from the bridge, still on the island, are the municipal swimming pools and the town's garden allotments. These are plots available to residents of Saint-Aignan who don't have land for a garden. A couple of friends of ours who live in town have one of the allotments and make the time to tend their garden there. Not much to report right now. The weather has been gray and rainy and the harvesters are working frantically to get the grapes in. The tractor tires are making big impressions in the mud between the rows of vines. That means lots of puddles now and through the winter. Most of the grape leaves turn yellow, but there are some that become scarlet red. The leaves are accelerating their color changes and are tumbling more and more. Those pine cones I showed you are falling into the yard. And boy, is it dark in the morning! The late sunrise and the cloudy weather make it seem like the middle of the night when I wake up. And dark mornings and evenings mean I don't take the camera out much. We're planning a Mexican-style lunch today. Steak fajitas, corn tortillas, re-fried beans, guacamole, and salsa. I'm making the tortillas this morning. Ken made the salsa yesterday with our garden tomatoes. Should be good. We're also looking forward to this weather system clearing up. We need to get out into the garden and pull up the spent squash plants and make a place to burn all the stuff there is to burn. Most of it is taking up space in one of my two compost areas. It's covered, so it should burn without too much problem, but I want the space freed up for compost. Then we need a good burn day: dry and no wind, or at least a light wind in the right direction. It's not stunning. But little by little the leaves are doing their thing. We're seeing mostly yellow right now, but there are some reds out there that should be showing up soon. The vineyard is starting to turn as well going from a deep sea of green to a paler, yellowish green. 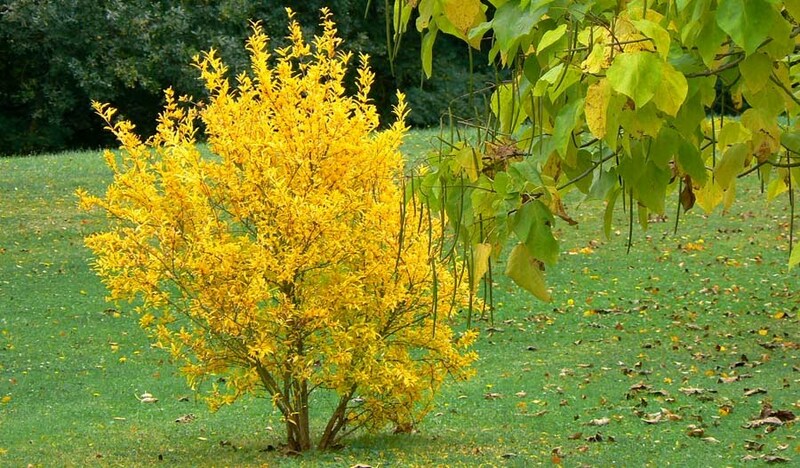 It, too, will quickly go to a brilliant yellow with patches of scarlet here and there. Looking out across a neighbor's property from our front terrace. Then the leaves will fall and the brown shades of winter will be upon us. But not before we rake up piles and piles of leaves around the house. The first feuilles mortes are already falling and collecting in those places around the yard that are sheltered from the wind. Our grass, in contrast, is taking on a deeper green color. It doesn't get cold enough in winter to kill off the grass and the small green plants that make up what we call a "lawn." And since the sun isn't very hot this time of year, the grass can continue to grow. It stays green all winter, thankfully. I've been talking about the walnut windfall we've been experiencing this year. There is a lone walnut tree out in the vineyard behind our house. We walk by it nearly every day with Callie. This year, it seems to me, the tree has the biggest crop of walnuts that I've seen in the seven years we've been here. A big basket full of found (free) walnuts from the tree in the vineyard. For a few days in a row Ken and I filled our pockets during our daily walks. I've made two walnut pies and I've toasted walnuts for zucchini bread and for salad. We still have a lot of them left. They are small, but they're very good and we're enjoying them. Callie loves walnuts. She'll stop under the tree and break one or two open to eat during her walk. Whenever I crack walnuts in the house, she sidles up and begs for some. She knows how to crack the shells and get at the good stuff inside. Amazing little dog. 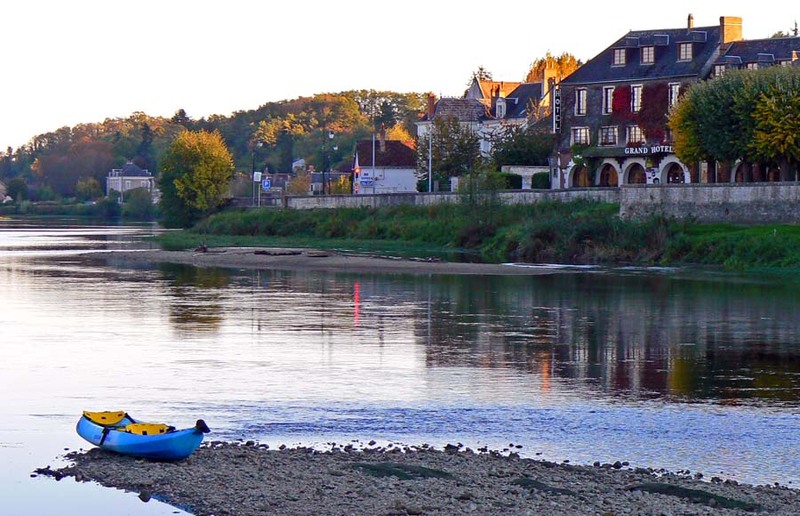 The town across the river from Saint-Aignan is called Noyers-sur-Cher. That means "Walnut trees on the Cher." I wonder if there used to be some walnut orchards over there. I don't really know of any now, but maybe they're there. I'm thinking of making some walnut biscotti this week. Stay tuned. 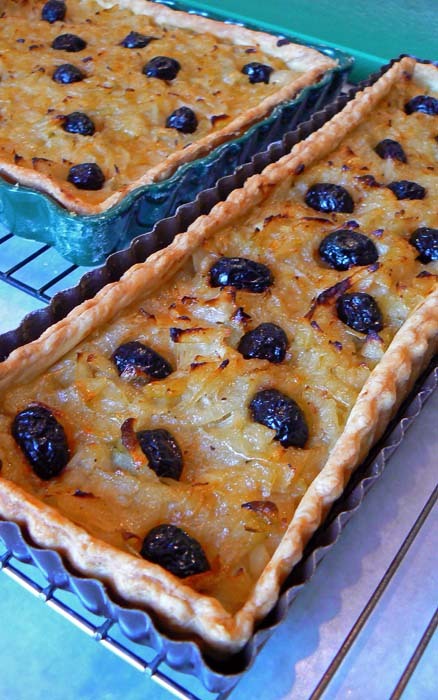 The classic pissaladière (onion tart) is a provençal dish made with onions, olives, and anchovies. I left out the anchovies for my version. Not because I don't like them, but because other people may not. I prepared these two tartes to share on Saturday and I wasn't sure if our guests would appreciate anchovies. Two pissaladières cooling on wire racks. I made my standard pâte brisée (pie crust) and blind baked it in two tarte pans. While I was doing that, Ken cut up one kilogram (about two pounds) of onions which we then put on low heat to cook, covered, with some olive oil, about a half cup of white wine, and a couple of bay leaves. After about an hour the onions were soft and succulent. I added salt, pepper, and a little nutmeg, removed the lid, and turned the heat up a bit to evaporate the excess liquid. I spread the cooked onions in the tarte shells, pushed black olives into them, and baked them for about twenty minutes in a hot oven. We ate them cooled along side some other finger foods. Very tasty! It's Friday, mid-day. We're just finishing lunch. Callie is hanging out on the living room rug watching. You know, in case something tasty should fall from the table. It seldom does. We've been very careful about not feeding her from the table. We made that mistake with our first dog, Collette. Once she got nibbles from the table she knew it was a source of food and she'd beg for it. 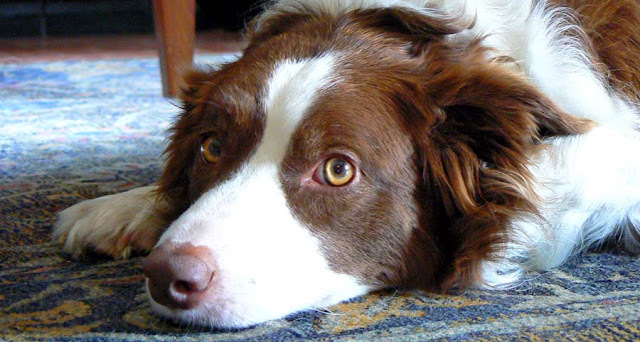 Collette would put her chin in your lap until she got something, then she'd come back for more. So if we want to give Callie something from the table, we wait. Then we put it in her bowl. That's where the food is. Unless it comes from Ken's chair by the t.v. She gets the occasional tasty morsel from there, and she knows it. Smart dog. Remember the little pine cones I showed you back on September 5? You can take a look at them here. Go ahead. I'll wait. Now do you remember? Well, here's what they look like now. 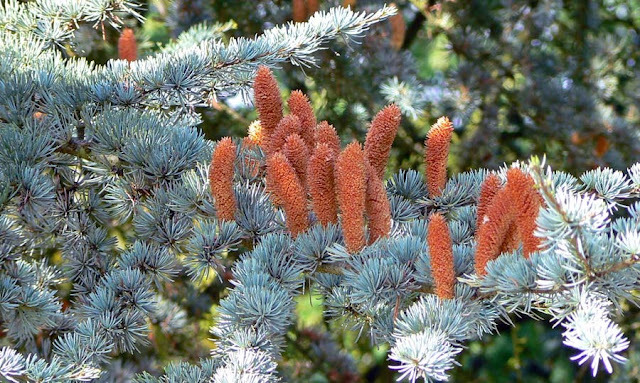 Fuzzy little pine cones like these will soon cover the ground under this tree. In just a few short weeks they will have fallen on the ground and will have to be raked up and toted to the burn pile. We plan to have a nice fire out in the one of the garden plots real soon. We've got a bunch of wood waste that needs to be burned (pine stuff that can't go in the wood stove). Most of it is what fell during the storm we had back in February. I just piled it up and it's been sitting there ever since. And leaves. We will have leaves. What doesn't get burned will be used to cover the garden plots for the winter to help keep the weeds down. Then they'll get plowed under in the spring.